NEOWOWS Ring toss is a fun and simple party game enjoyed by people of all ages. How to play the ring toss game. Players are given five rings to try their hand "ringing" one of the individual glass sodas. To play, choose a line from which the players will throw. The first player then tosses their first ring at the wooden pegs. Then the second player will toss their first ring. The players keep switching back and forth until all rings have been thrown. If they ring a soda, they get to keep a two-liter bottle soda as their carnival prize. If they loop more than one, they can choose which one they keep - but they can only keep ONE. If players do not "ring" a bottle, they receive a consolation prize. 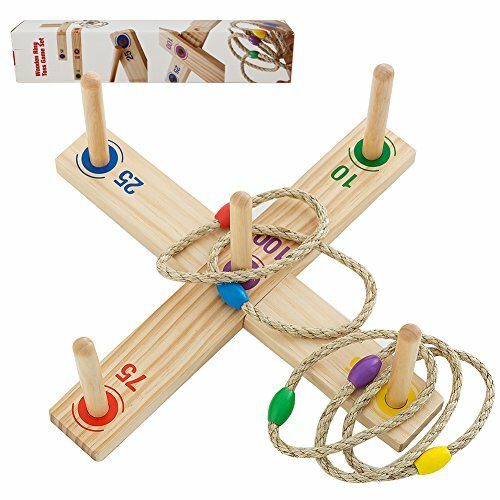 INTERACTIVE GAMES FOR FAMILY - The ring toss game set includes 5 durable rope rings: a sturdy wood base with point markings screw in pegs. Entertainment and wholesome fun for all family. NATURAL WOOD QUOITS GAMES - Made of non-toxic, child-safe and durable material, and its sturdy construction ensures it will last through years of hands-on play. PIMPROVE EYE-HAND COORDINATION & MORE- Help positively channel a child's physical and mental energies, as well as fine motor skills and even facilitate the understanding of complex math equations.Not only do kids improve their interpersonal skills but also learn valuable lessons about team spirit and healthy competition to be a socially adept. REMIUM ENTERTAINMENT - Works great on birthday parties,tailgates, barbecues, summer picnics and family reunions! And you can play it anywhere like lawn and yard. QUICK & EASY SET UP - The ring toss game can be put together in minutes. No tools necessary.And varieties of different styles the wooden peg can be piled up. If you have any questions about this product by NEOWOWS, contact us by completing and submitting the form below. If you are looking for a specif part number, please include it with your message.